With all of the fun items from the Sock Monkey Party Supplies collection, it's easy to create a party your birthday boy and the guests will remember forever! Get tableware items like plates and napkins, decorations like banners and flags, and fun favors like lollipops, headbands, and more, sure to help you create a great day! Bring a classic twist to your next themed birthday party! Sock monkeys have been around for ages, but they’re not going out of style any time soon. These adorable monkeys have become an American favorite over the years. With all of the party supplies you need right at your fingertips, there’s no need to monkey around. Get party planning! Wow your kids with the classic cuteness of these fun little monkeys. Whether you need a complete party package or a few odds and ends, you’ll find everything you need for a successful sock monkey extravaganza. Add in custom touches to make your little one feel special. 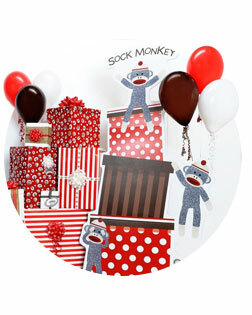 Try a personalized banner and balloons to decorate the room in sock monkey style. Then, place sock monkeys around the table so they can get in on the party action! Not sure where to get started? You’re not alone. Get inspired and find some great party ideas on the Birthday Express ideas blog. With countless themes to choose from, you’re sure to have the lightbulb moment that sets you on the track toward the perfect party. It’s not a party without all your friends! With celebratory personalized invitations, you’ll be able to make your guests feel special when you request their presence at your event! With matching red envelopes, it will look like you thought of every detail. From balloons and banners to tableware and party games, don’t forget any of these important birthday party elements. Personalize your decorations so everyone knows whose special birthday it is and your guests feel welcome and excited to share in the celebration. From DIYs to pre-made decorations, pick and choose to find a decoration layout that works for you. You’ll have so many decorations that your guests will be able to take some home and share in the sock monkey festivities! A birthday isn’t a birthday without an abundance of balloons. This American classic comes in balloon form for decorating chairs, tables and the entire party room. Add eye-catching detail as the balloons float freely about while your guests eat cake and have a blast! Complete the ultimate party look with a personalized sock monkey banner. Make it your own with a favorite phrase or inside joke, or simply use the guest of honor's name. Don’t settle for any plain tableware. 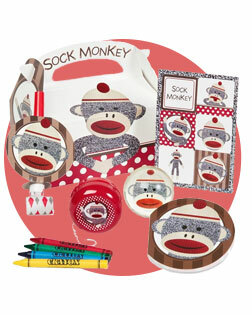 You’ll need to go all out with adorable sock monkey plates, cups, napkins and plasticware. You’ll have every guest and their parents dreaming of sock monkeys for days! You’ve got all the decorations set up and ready to go, but what about the activities? Sock monkeys are known to be a bit mischievous, so keep the kids from getting too wild with some of these fun ideas. No matter what the average age at your party, these activities won’t disappoint. From hitting the piñata to coloring and photo shoots, find activities and games to fill your kids with joy and excitement. A classic party favorite, this piñata doesn’t mess around. Piñatas entertain kids young and old, and this sock monkey kit is sure to be a hit. Don’t worry about buying candy, a blindfold or a piñata buster; you’ll find everything you need in one convenient package. Keep the little ones busy without much effort with these exciting activity placemats. These mats give each child their own space to sit down and get creative with colors and puzzles. 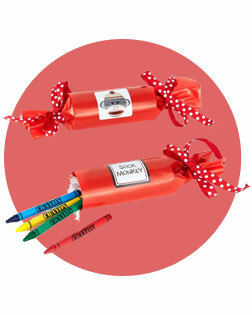 Keep one at each table settings and have the kids complete during the party, or place them in a take-home treat bag! Your guests will have so much fun at your sock monkey party and they’ll want something to take home to help the memories last forever! From favor boxes to do-it-yourself ideas, you’ll find the inspiration to create the perfect take-home gift for your friends and family. Impress all the other parents as your kid’s sock monkey party will be on everyone’s minds for weeks. The monkeying around can last even longer with these take-home treats. In each box your guests will find crayons and a notepad, a bouncy ball, yoyo and sticker sheet all in the sock monkey red theme! Tap into your creative side with these DIY Sock Monkey Red Favors. Each kit has enough for 8 party guests to take home a celebratory decorative treat. This is a great addition to any party favor box. You only want the best for your son or daughter’s birthday. Make the party extra special and bring it to life with personalized banners, plates, centerpieces and favor boxes. Think about how excited the guest of honor will be when he sees his name everywhere! Personalization is a great way to create keepsakes and everlasting memories. Bring an element of High Definition to your sock monkey celebration. The latest in high definition technology brings each personalized banner to another level. This eye-catching decoration is sure to make your party pop. Don’t even think about using some plain, boring plates for your sock monkey themed party. 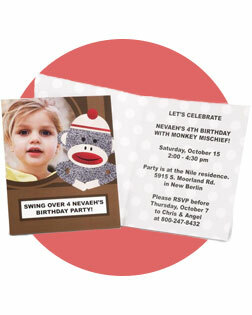 The Sock Monkey Red Dinner plates can be personalized with a photo of the special birthday child!